A report was submitted to us about strange circle in the woods found on Google Maps, about 40km south from Vilnius, the capital of Lithuania. Our research team was immediately assigned to investigate. Two of our investigators from Vilnius took a trip to investigate the matter. 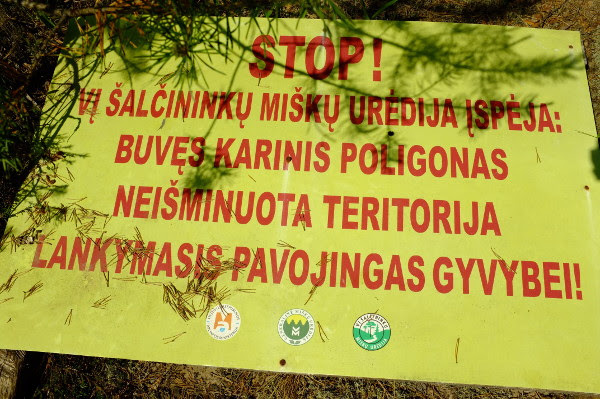 Just before arriving to the exact place, which is located deeply into the woods, signs were observed, warning about possible world-war residual land mines in the area. 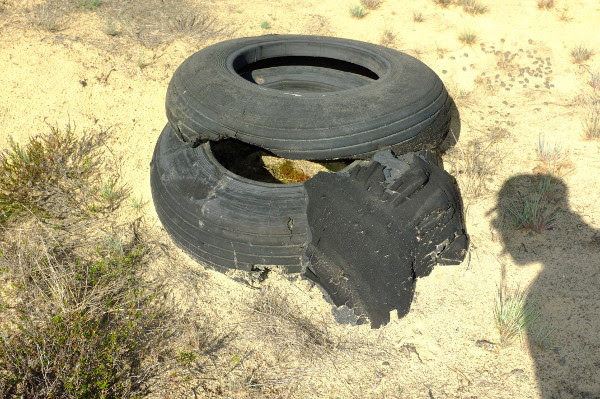 It was neither safe nor possible to continue approaching the territory by car, because of mines and very poor road condition. The expedition continued on foot. 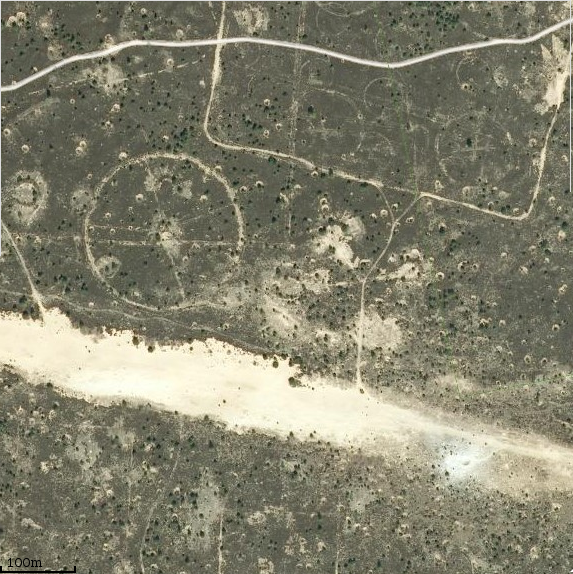 There were about 3 kilometers to the epicenter of the area and the strange circles. Investigators had to take precautions when entering the field. They deemed it should be safe to walk only on the trails already made by military vehicles, because there was a high risk of stepping on a real mine. These vehicles obviously had their path cleared first by mine sweeping crews as evident by many deliberately exploded mines on both sides of such trails. 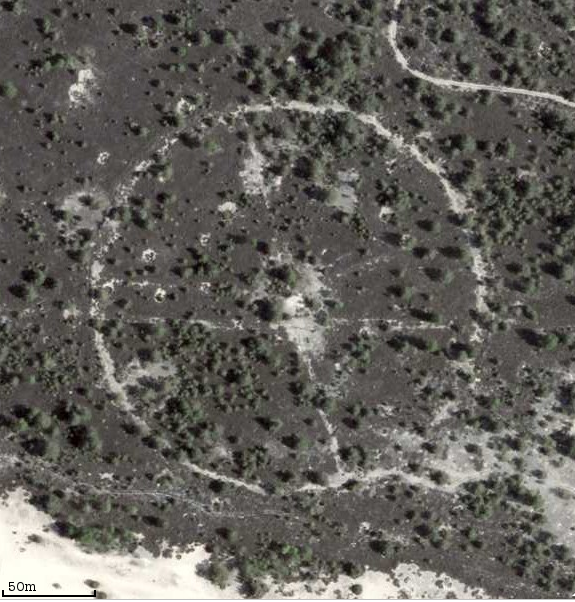 However, because of the everlasting conspiracy theory that governments, aided by military forces, often hide traces related to UFOs, investigators decided to continue searching for the epicenter circle in the field and confirm its origin. This was a very risky decision and is not recommended by our safety guidelines, but finally investigators were able to safely reach the coordinates of investigation point by carefully following the path made by said military vehicles. 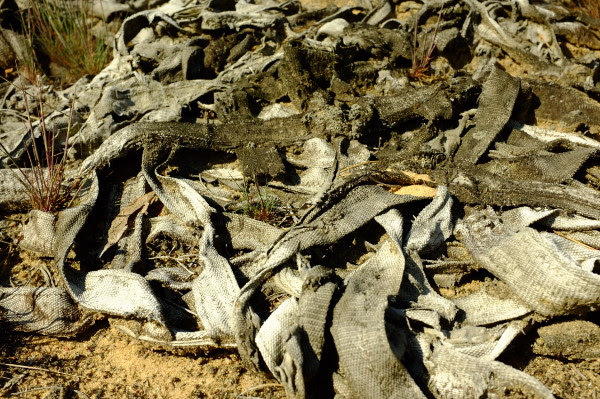 The explosion craters in the sand left after demining were observed along the way together with metal parts of the exploded mines. 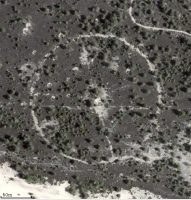 The investigators were able to reach only the side of the circle. The path to the epicenter was determined unsafe to follow. The standard measurements of Geiger, EMF and magnetic fields were not taken, because there was no possibility to carry all the equipment by foot. However a sample of a few very thick cast iron shrapnel, possibly from the exploded mines were collected. Nothing anomalous was found. 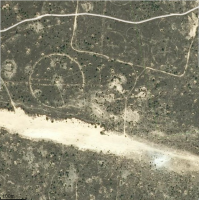 The circle seen in map was just a path made by military demining vehicles and the sweeping crews. A few days later, a second, more prepared research team was sent to make radio scans, magnetic field and Geiger measurements, just to be sure, but no deviations were found. Aerial photos with remotely controlled aircraft were not possible to take by either of the two teams because of strong winds. The second research team confirmed the findings of the first team.